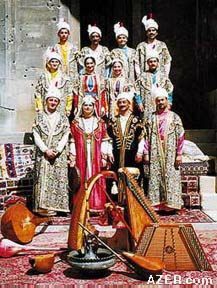 Left: The National Ensemble of Ancient Traditional Musical Instruments in front of the Shirvanshah Palace in Baku's Inner City. Majnun Karimov, who directs the ensemble, has reconstructed eight of these early instruments. Left: Barbat. From Azerbaijan International (9.1) Spring 2001.